This recipe comes with a asterisk though, it was my first ever pastrami, and since I cooked it, I've already learned more about this cured meat tradition that's wasn't reflected in my starting process. On of these points is the cut of meat. 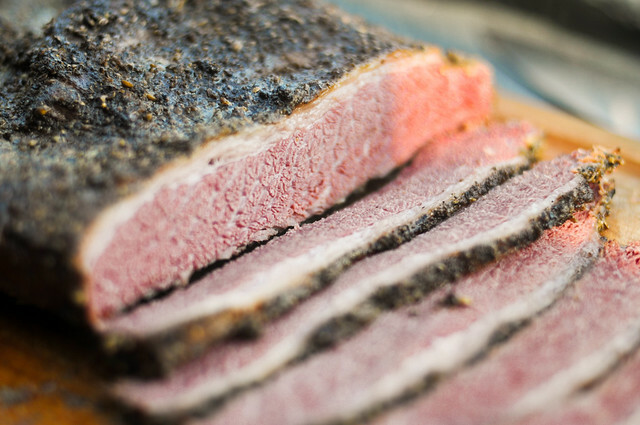 Yes, it's true many pastramis out there are being cooked up with the brisket flat, but I've since learned that it's the less common navel cut that's more traditional and might be key in upping my pastrami game (thanks to its intense fattiness). Still the flat is easier to procure and makes a mighty fine pastrami, and that's exactly where I started. Once I had the flat (the point was removed and smoked into burnt ends), I started the long curing process. 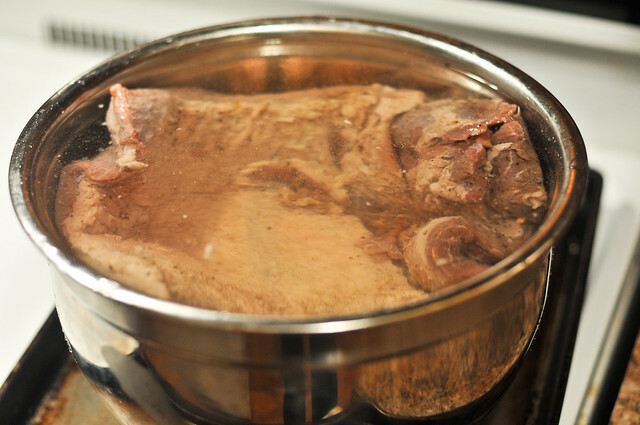 Being my first foray into curing, I did a lot of research into this and opted for a dry cure which would increase the the concentration of salt on the surface, draw out moisture by the process of osmosis, then the meat would reabsorb this liquid over the time of the cure. Compared to a liquid brine, this method results in an increase in the penetration and overall flavor of the cure. I used Morton Tender Quick as starter (avoiding having to find the right ratio of pink salt to regular salt) and mixed that with other traditional curing seasonings like brown sugar, pepper, coriander, garlic, and allspice. The brisket was coated and into a doubled up extra-large Ziploc bag it went. It then sat in the fridge to cure for four days, and I flipped the bag twice a day to ensure the brisket was evenly curing. I was kind of expecting the beef come out of the cure the deep red color of cured meat, but instead the outside was an unappealing gray. I was kind of disheartened, thinking my cure didn't work, but I went forth with soaking the meat to remove some of the saltiness and prepare it for smoking. 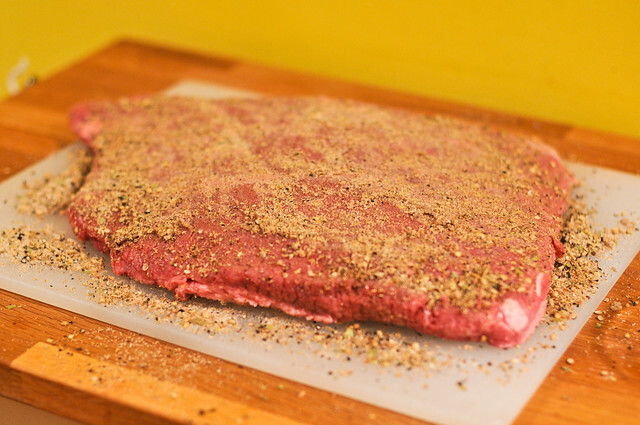 Before hitting the smoker, the flat got a heavy coating of that ubiquitous pastrami rub that consists of mainly black pepper and coriander, with a little granulated garlic as well. 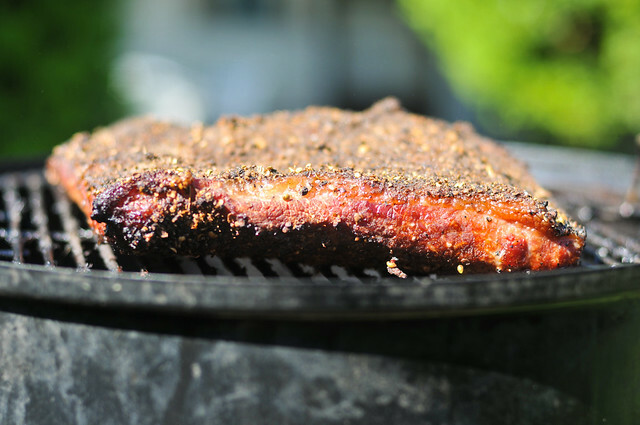 The rub was so thick and potent, the the house was already filling with the aroma of pastrami. When it came to smoking, I was a little of unsure of myself. I'm so used to barbecue brisket, which I cook to between 195 to 205 degrees, but pastrami is a different beast. 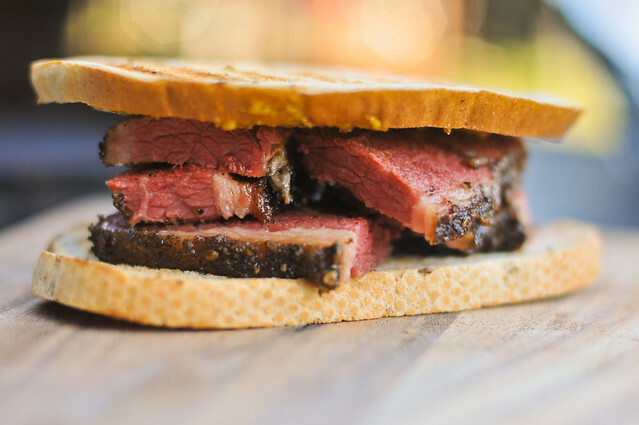 While barbecue is smoked until most internal fat and connective tissue breaks down and renders, I wasn't sure that was the right approach for pastrami, which needs some extra structural integrity to be able to be sliced thin. In turn, thinner slices means they'll be more tender just by the cut alone, and maybe cooking the meat to those high temperatures was not fully needed. So I let the pastrami smoke until it hit 165 degrees, when it was just cooked through, but still a relatively solid piece of meat. At this point I wrapped the pastrami in foil and let it rest in a cooler for a couple of hours. This rest resulted in an accidental step in the process I didn't consider at all, steaming. 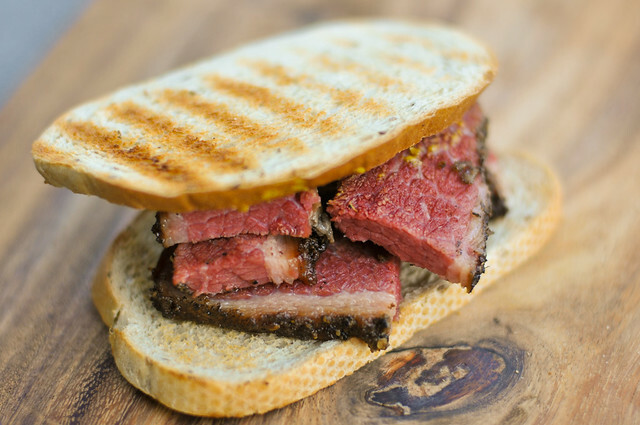 After smoked, a traditional pastrami will either be finished by steaming, or let cool, then steamed to bring it back up to temperature. Either way, the steaming helps the overall moisture, making those tender slices all the more succulent. Since the pastrami was hot when foiled, it did "steam" in a half-assed way, but not to the extent I should have done. 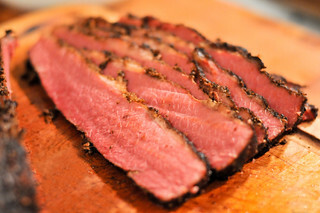 Salty, spicy, and smoky pastrami is fantastic homemade, a long, but not difficult, process that's incredibly rewarding. To make the dry-cure, mix together Morton Tender Quick, dark brown sugar, black pepper, coriander, granulated garlic, allspice, and bay leaves in a small bowl. 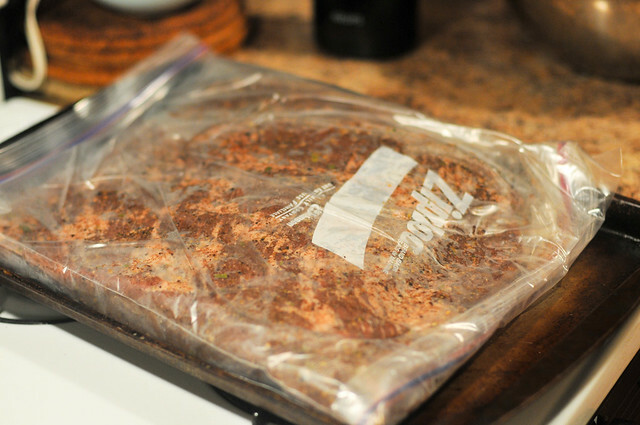 Coat entire brisket with the cure and place in a large resealable plastic bag. Place in the coldest part of the refrigerator and cure for 4 days, flipping brisket twice a day. 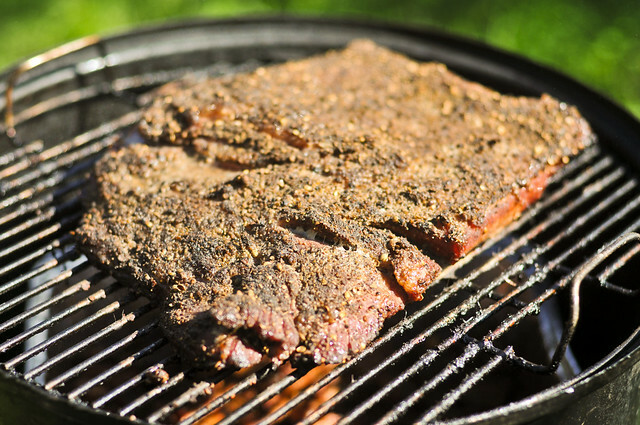 Remove brisket from bag and wash as much cure off as possible under cold running water. 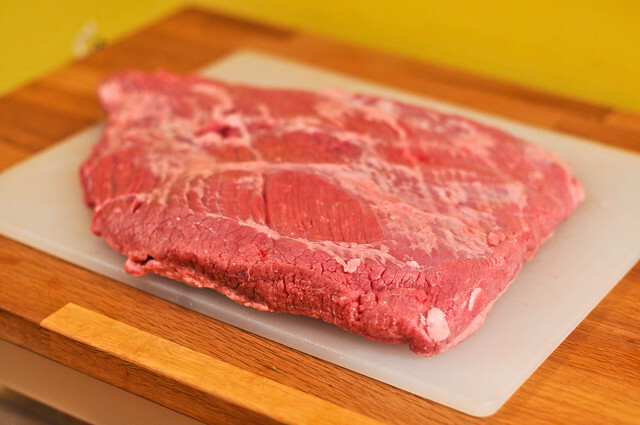 Place brisket in a large container and fill with water and let soak for 30 minutes. Remove from water and pat dry with paper towels. To make the rub, mix together black pepper, coriander, and granulated garlic in a small bowl. Coat entire brisket with the rub. Man I love pastrami but we only make it about once a year. For a first time, yours looks damn good. This makes me so hungry. I love a nice hot pastrami sandwich. @Bert I add the wood at the beginning and it usually burns slow enough to to last most of the cook. 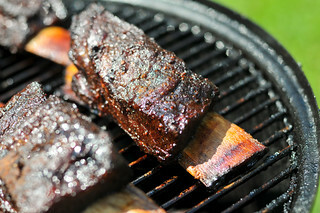 The smoke permeates the meat mainly in the first few hours of cooking, so if the wood chunks run out, it's not totally necessary to replenish. I didn't have allspice so I subbed it with pumpkin pie spice and a little nutmeg. Also I'm using an electric grill smoker. Results may vary but I'm still smoked, uh I mean stoked. So I put the dry cure on the brisket, it is now in the fridge for the next few days before smoking. I realized I forgot to trim the fat cap. Should I still do this after the cure? Or leave it on? Thanks! @Jay I'd personally leave the fat cap on, but I love really love beef fat. If you don't dig on the large chunks of fat, go ahead and trim it down to about 1/8" after the cure. I smoked this pastrami yesterday and it was superb. 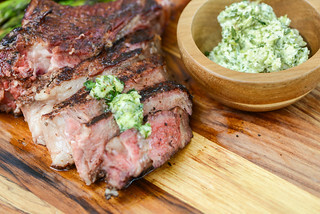 Unlike the previous recipe I used which was reportedly reverse engineered from Katz' Deli in New York (bring temperature up to 190-200 degrees), this recipe takes the meat off the smoker when it reaches 165 degrees. This allowed the meat to be sliced for sandwiches. With the previous recipe, the meat fell apart when I sliced it. The flavor was outstanding. Yeh but I twiked it a little used groud mustard all spice and?? But my whole family loves it so do my customers since I have a meat shop and been in the business for 25 years awesome start on this wonderful recipe . @Denise I'd use 1 teaspoon pink salt for every 1/3 cup of Kosher salt. Josh, Just made your Pastrami using your spice rub mixture (ps - all the recipes I found online have basically the same ratio of Black Pepper to Corriander ) and find it way too spicy. I luv deli pastrami but I must be missing something. after 1 bite taste buds are swimming in Black pepper heat. What am I doing wrong ??? 2. I cook to 203, wrapping in foil at 165. super, super tender that way. 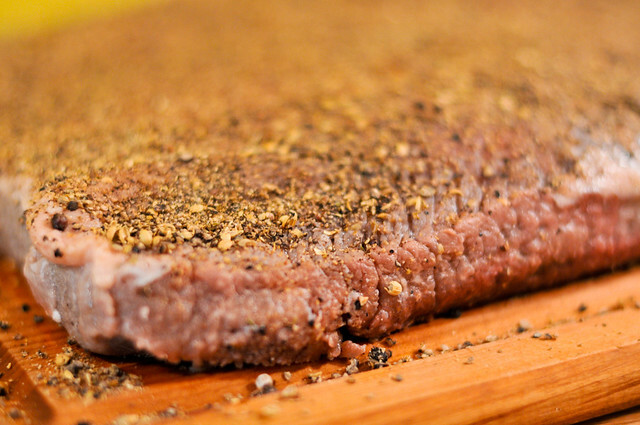 Thanks for posting this, this is my go-to for pastrami, and the rub is perfect.